Crofton House School, Vancouver, B.C. St. George's School, Vancouver, B.C. St. John's School, Vancouver, B.C. Shawnigan Lake School, Shawnigan Lake, B.C. West Point Grey Academy, Vancouver, B.C. More than 150,000 students and parents have participated in presentations of "The Admission Game®" in 26 states, nine countries, Puerto Rico and the District of Columbia. The following is a sampling of what they have to say about Peter Van Buskirk and "The Admission Game®." "I am the parent of an 11th grader and it's the first time through the college process for our family. Your advice was clear and reassuring. I can't wait to sit down with my husband and my daughter and review the admission process as you describe it. It seems much more manageable after your presentation. "I wanted to tell you how much I appreciated your seminar, "The Admission Game®," last week. I learned so much. My son is a junior. This whole process is so daunting for parents, and students too. Your availability after the program meant a lot, and I really appreciate that you make yourself available by email too. Very generous! Thanks for doing the work you do! I am glad I got your book. Hopefully that will answer any other questions we do have. Thank you so much!" "One of the best presentations I've ever attended, and I've been to many! Truly a world class motivational speaker!" "Helped me understand the work I need to do in order to 'compete' and get into college." "Being a first time parent of the college admission process, I found your program and book to be extremely beneficial to both me and my daughter. We would not have made it through without your incredible insight! I feel my daughter was accepted to the school of her choice due to the knowledge she learned from your book and weekly blogs! Thank you!!" "We are grateful for your support and want you to know that our daughter is now in college… Your past feedback has been valuable and we wish her high school had offered it before her senior year… Perhaps more information from advisors like you would help to encourage students from our small rural community to understand that they can succeed at the college application process. Kudos to you and your program." "A lively and informative presentation… helpful for parents and students to see the inner workings of the selective admission process." "Your program was fantastic. I cannot remember being at any presentation on any subject matter that was as powerfully presented as yours. You are clearly a very talented public speaker and, I must admit, I was blown away by what you had to say… You certainly cleared up many of the myths!" "You definitely gave me some confidence and a much-needed wake-up call in terms of actual extracurricular involvement. I learned a lot more about the admission process, especially about diversifying myself and going to college functions that will "put me on the map." You made attending this program worth my time!" "Your program provided a wealth of inside information which will prove invaluable as we navigate this daunting process. Your book is the best I've read about the admission process−and I've read dozens! Thank you so much!" "I don't feel so clueless anymore! You rock dude!" "What a dynamic and engaging speaker with realistic advice!" "Thank you for the help you gave my daughter during our college search… We greatly benefited from your presentation of "The Admission Game®" last summer. She applied to ten colleges, was accepted at all of them and offered academic scholarships at several. I truly believe your advice was a key factor in her successful application process." "Geared perfectly to the needs of this audience. You really honored our expertise and understanding of the subject-and took us higher. Just great! Thanks!" "This is an event and a speaker not to be missed by any student or parent of a student who is applying to a selective college!" "The best college information night ever. I was so pleased that students really participated enthusiastically in the dialog." "Dynamic, informative and enlightening… Your presentation will help guide my daughter and my son to hopefully make the right choices not just in their academics but in all their other activities." "Perhaps the best testament to your ability to keep your audience on the edge of their seats was the response of (a colleague). She told me she came in to put in an appearance, expecting to stay for half an hour at the most. She was so interested, though, that she couldn't tear herself away-and she gave up 'Law and Order' for you!" "I liked when you said that each day is made up of little choices… Your presentation helped me put in perspective what colleges are really looking for." "Great energy and rapport… (demonstrates) real understanding of teens and parenting." "This program helped calm my college nerves. I feel more confident in the process now." "Peter's enthusiasm and commitment to the college prep process was refreshing. I appreciated that he explained the need for diversity within the context of academic and social excellence." "Good humor, wonderfully honest stories and specific examples made the admission process come alive! It made a very mysterious process much more personal, understandable and real." "Your presentation was engaging and entertaining and full of good tips. I went home and confirmed with (my son) that his senior program did matter and that he had signed up for all the right courses. Now, if I could just have similar influence over the grades he earns..."
"I had a lot of delusions dashed upon the rock of reality. Opened my eyes to the competition." "I have been to many lectures on the college process but none compared to your presentation. It was creative, informative, thorough and motivating. I wanted to give you a 'thumbs up' and tell you that both my daughter and I enjoyed the evening-and I even learned a few new things!" "You made a huge difference in our lives because you helped us to regain our confidence at a time when we were struggling to keep any confidence." "Tremendous program… interesting, entertaining and hit all the spots I wanted to hear about. I loved his compare and contrast style. His conclusion was honest and he connected with me (and I think all in the room based on the response). I love what you do… same advice I give my children." "Your presentation exceeded my expectations. Over 200 people were galvanized by your analysis and the next day saw my classes engaged in lengthy dialogue about the points that you conveyed." "I went through my first college selection process with my oldest son last year. Our college search last year was one of the most stressful events of my life. We have taken this effort pretty seriously-our family has visited 30 college campuses over the past three years. My wife and I learned a great deal about the process from you. We thought that we were seasoned veterans! Your vivid presentation laid out the process so well. Thank you for caring about our boys." "Kids really need to hear what you have to say. I only wish my son had heard you last year when he was a sophomore because you really had an impact on him last night. You validate what we 'know little' parents have been trying to hammer home-and you do it very well. Hats off to you!" "You truly know teenagers! Great insight!" "An inside perspective and good advice on the college admission process without sugarcoating." "Really enjoyed and learned a lot. Definitely gained information/strategies that wouldn't have crossed my mind. Better idea of things to focus on and maintain; liked hearing that a compelling essay/personal story can be a hook." "As a parent who has been through the college application before, I was incredibly surprised and delighted with your session… Yes, I was one of those parents who initially thought "what am I doing here?" but after a few moments of you speaking, I was totally engaged in what you had to say… Thanks for a surprisingly wonderful evening." "Easily the best/most informative lecture on the college process I have ever heard. Even after a long day watching the stock market I was able to stay focused on your content. We have a senior and two freshmen and are well into the college process. I actually find the search to be a blast. You made great points about fit and community building." "With humor and understanding, Van Buskirk leads students through the college admission process. He tells you what college admission counselors don't want you to know and breaks down classic stereotypes to help students find the perfect college. Van Buskirk brings the whole admission process to a less stressful and almost enjoyable level." "A wonderful presentation… The feedback has been so positive! You covered all the bases and helped families to see all the possibilities-and allowed for a real eye on the inside!" "Energetic, engaging and concise, Peter had the full attention of a large crowd of parents and students from multiple grade levels and schools. He explained the college process as an overview and then gave specifics that applied to a broad spectrum of interests and abilities. I would not hesitate to host Peter Van Buskirk ANYTIME he is in the area!" "Your dynamic and interesting presentation gave the students and parents who attended a much clearer understanding of the admissions process. With your help, we were able to provide a valuable service for our community." "Peter's energy, enthusiasm, and expertise are amazing. All eyes and ears are glued on Peter as he explains the intricacies, "myths," and secrets of the college admission process to under-informed audiences. His interactive, engaging style is perfect for both families and professionals. Even counselors who thought they understood how and why decisions are made at selective colleges were thrilled at Peter's 'common sense approach' and 'great insights into the admission process.' 'Every parent should have this gift!' exclaimed one participant of the summer conference I coordinate for experienced high school counselors." "Hotspots and Hooks" and the application review were exceptional and allowed greater insight into how to help my advisees. I will be a better advisor as a result. The application review was valuable and immediately useful in my everyday experience with my students. Great info and insight!" "This info was fantastic. Having an historical context of admission is priceless, especially since I have a board presentation coming up. The more info I have like this I can share with my families the more comfortable they become working with me. Having the info on the rankings was great. I feel as if my toolbox to educate families is now loaded with the strongest tools. You connected many of the dots. Thank you! "I learned more from Peter in three hours than I did during a full week at the summer institute last year!" "Peter, you just keep getting better. Thanks so much!" "Peter Van Buskirk speaks with the wisdom of both a veteran admission officer and a loving parent. Winning the College Admission Game offers valuable insight on the college search process for students and parents alike." "Winning the College Admission Game is fun to read and filled with insider information. Peter Van Buskirk provides insights to assist you in helping your son or daughter make that important decision about college. In particular, don't miss the 'Hidden Agenda,' 'behind the scenes of the admission committee,' and 'strategic nagging." "Finally, a student-centered approach to getting into college! Peter goes inside the process and tells it like it is. His ability to engage both the parents and the students with meaningful solutions makes this a 'must read' for families getting started in the college admission process. I am sure that college access professionals engaged in the work of the National Council for Community and Education Partnerships (NCCEP) will find this resource guide helpful in guiding more low-income and minority students to gain access to postsecondary education." "Peter Van Buskirk was always one of the few admission deans who was willing to tell it like it is. His chapter on "What Colleges is Want" is a gem and could only have been written by someone who spent the better part of his career doing just that. As a school counselor myself, I am weary of books that sensationalize and distort the reality of the admission process. This one lifts back the curtain on college admission and also gives sound counseling that will help both parents and students keep their feet on the ground. Highly recommended." "If the process of college admission was a maze, this book would be the map to help navigate through it. With its helpful insights on how to keep organized, interviewing tips, essay writing tricks, and guidelines for Mom and Dad, this book would help the family "team" avoid dead ends." "Through thoughtful analysis and lively anecdotes, the author welcomes the reader into the complicated and seemingly capricious world of college admission. Like a trusty guide in a foreign country, Van Buskirk orients teens and parents to the language and culture of college admission and provides valuable context and advice for their own unique journeys." "I bought your book on Friday and can't put it down, my daughter will be reading her side sometime this week. It has been extremely helpful to clarify my position in the game. So yes, I am stepping down. Thanks for your help on my questions below, [XYZ College] is probably out of the question unless she decides to play the lottery. She has a list of several schools that seem to offer what she needs. We will continue to consult your book. Thanks again." "With wisdom, insight, and realism, Peter Van Buskirk tells it like it is. This book provides practical advice for how to succeed in the college admissions process, not just survive. The best part is that as a parent and an admissions professional, Van Buskirk knows that "winning" the game means something different for every student. The objective is to identify and gain admission to the colleges that will best fit each individual's academic, professional, and personal goals. Van Buskirk's book will help students make that happen." "This book is a must-have for all parents. Read it when your child is young and continue to read it to remind yourself of all that is involved as a parent in helping your student make the best decisions for herself or himself and your family--the first time! The contrast of the Pyramid of Selectivity with the Admission Funnel provides visual images that truly clarify the process of admission to college." "Amid the clutter of books telling students 'how to get in,' this book poses the far more important question of 'where do I belong?' Peter Van Buskirk makes it clear that 'winning' occurs when a student thrives socially, academically, and personally. This rule book will make that kind of 'winning' more likely." "This high-quality book takes you through the process of getting into college. It is easy to understand, explains what families should be doing-from the beginning of the process of looking for the right school(s) and what those schools look for-to applying for financial help and handling acceptance or rejection." "Peter Van Buskirk's strategy for applying to college emphasizes an individual's fit with a college, not a college's ranking in a magazine. Winning the College Admission Game gives a comprehensive and succinct overview of the nerve-wracking college admission process." "Winning the College Admission Game makes even the daunting task of applying to college seem less intimidating. Keeping organized will be easy with a season-by-season chart of preparing for college throughout high school and checklists for course selection and campus visits." "Winning the College Admission Game takes you though the steps necessary to select a college based on reason, not stress; confidence, not uncertainty; and academic quality, not merely 'big name'. With extensive experience in the system, Van Buskirk can be trusted to help you find a good match college. Check out this book. You'll save both tears and dollars." "What I found most useful about this book is its pragmatism toward college admission. It explains what colleges, as businesses, are looking for but don't tell potential applicants. Winning the College Admission Game will help students realize what they are looking for in a college." "Winning the College Admission Game provides two interesting views of the college 'scramble'. By dividing the book into parent and student sections, Van Buskirk allows both parties to benefit from an easy-to-understand guide to the college admission process. This book was very educational!" "I enjoyed reading your book, Winning the College Admission Game and am using it to help my juniors and seniors and their parents with the college admissions process." "This is actually two books in one-one geared to parents, the other for students… the author emphasizes the importance of finding a college that is a good fit for the student and disregarding the hype surrounding college rankings, and provides good tips for the student in narrowing down choices. He also tells parents to back off and let their kids take ownership of the process, while at the same time giving valuable pointers as to way parents can support and guide their teenagers along the way. The book's greatest strength is the author's frank and eye-opening discussion of the hidden agenda that drives college admissions and financial aid decisions. I wish I had this book before my kids applied to college, so I am speaking from experience when I say that this book contains some important and valuable truths that are ignored, misunderstood, or glossed over in other college books. If you are new to the process, buy this book first-and if you are in the midst of the process and hopelessly confused… buy this book." "If you're not a subscriber to Peter Van Buskirk's blog it's worth your time. He has a knack for describing facets of college admission in ways families need to hear. Here's a good example. For me, helping families put rankings in perspective without sounding "down" on them is always a challenge… Peter has armed me with some family-friendly arguments I hadn't thought of." "I wanted to take this opportunity to tell you, Peter, that I think your College Planning Blog is genuinely outstanding. The best of any and all communications on the subject of college admissions. Many thanks for your great work." Q. Our budget is tight. What are some ways your clients fund programs? Collaborated with neighboring schools to share fees/expenses. Q. 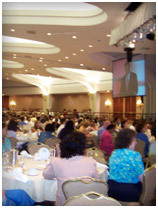 How can clients maximize attendance at programs? Publicize the event in the local media. Peter is available for pre-event interviews with media reps. Send announcements/reminders to families via email. Promote the event through the school's parent association. Use RSVPs with the invitation/announcement. Promote with coupons (available after the program) for extra credit that can be redeemed with teachers. Plan to disburse "official" school-based information (college planning packets, PSAT results) to students.